True crime author Suzy Spencer’s Breaking Point was initially published just after the murders, when media scrutiny of the Andrea Yates case was at its most intense. In 2002, Yates was found guilty of murder and sentenced to life in prison—though many in her home state of Texas called for her to get the death penalty. But in 2006, she won her appeal and received a second trial; this time, she was found not guilty by reason of insanity, and now resides in a minimum-security psychiatric facility. Spencer followed the case from start to finish, and with the recently-released new edition of Breaking Point, she was finally able to fill in the details she felt were missing from the book’s first printing over a decade ago. We spoke with her about the surprising complexities of the Andrea Yates case—and the ways in which it changed mainstream perceptions of mental illness. io9: When did you become interested in Andrea Yates, and when did you decide to write a book about her case? Suzy Spencer: I was at the hospital with my aunt, who’d had a stroke, when the Andrea Yates case broke on the news. I pretty much totally ignored it, because I didn’t want to hear about it! But [days later], I got a call from my agent asking if I would do a book on the case. I just went, “Yikes,” you know? I talked to my family about it, and my mother said, “Somebody’s going to write this—and you will do it with more sensitivity than anyone else.” So I said yes. I learned later on that St. Martin’s Press, the original publisher, had approached my agent after they’d gone through several other writers. Everybody else had said no, because—I think, I’m not positive—they were all mothers. And I wasn’t. People tell me that gave me a little bit of distance. I could emotionally handle the case better. That was on a Monday evening, I believe, that I said yes. By Tuesday morning, the deal was done and by Tuesday afternoon, I was on my way to Clear Lake, [the suburb of Houston, Texas where the Yates family lived]. The following day, I was at the funeral. So you were really there every step of the way. How long, from start to finish, did you spend working on Breaking Point? I was assigned the book at the very end of June 2001, basically July. I turned it in at the end of the following November. I originally had four months, and I stretched it to five. All along, the plan for that book was for it to come out before [what would later be known as] the first trial. All along, I wanted the book to cover the entire case, but the publisher was adamant: no, it had to come out before the trial. The acquiring editor at St. Martin’s was Charles Spicer. He’s kind of considered the king of true crime. But he usually assigns someone else to do the actual editing. The guy who did my actual editing, he and I had always planned that an updated edition would come out later with probably 75 extra pages; we’d maybe trim down the competency hearing and put in the regular trial. It ended up that didn’t really happen. St. Martin’s eventually allowed me to do four additional pages, I think it was. That just wasn’t ever satisfying to me. When the book eventually went out of print, I still had this fantasy, this dream, that I’d be able to write the full story. Thanks to my new literary agent, and Diversion Books, after approximately 13 years, I got to complete that dream by writing the entire story. After that length of time, Dr. Lucy Puryear—who was the expert psychiatric witness for the defense—opened up her files to me. She said, “Sure, come down here. I’ll lock you in my garage apartment [laughs] and you can go through all the files.” At the end of three or four hours of doing that, she said, “I don’t really know what to do with these files. I don’t want to throw them away, so take what you want.” So now, sitting in my hallway right now is a big box of Dr. Puryear’s files, and I know she’s never shown another reporter her files. Many people only recall the fact that Andrea Yates drowned her kids, but as Breaking Point recounts, there were serious medical issues that affected her behavior. Do you think if she’d been properly treated, the tragedy would never have happened? Most definitely. If she hadn’t continued to have kids, if she’d been taken back to her original doctor, if her insurance hadn’t run out and she could have been treated longer—or treated at a different facility—this probably would not have happened. If not just [Andrea’s husband] Rusty Yates, but everyone, had had a better understanding of postpartum depression and psychosis, and what it does to you, I think this never would have happened. But one of the interesting things that Dr. Puryear has said a few times, and it stuck in my head: Andrea Yates would have been mentally ill no matter what. But she never would have killed her children if it had not been for the influence of [street preacher] Michael Woroniecki. I was going to ask you about that, since—as your book explains—Andrea Yates believed that by killing her kids, she was saving them from Satan. What impact did religion have on her illness? One of the things I was told was that when a person is psychotic, the last thing you do is talk to them about religion, because their psychotic mind can’t process this. I think I even got a letter from someone who read the book, who had gone through postpartum psychosis, and explained this to me in detail: things that are maybe symbolic [to everyone else], when you’re psychotic, you really believe it. It’s like, if one eye is causing you to sin, pluck it out. That kind of stuff—you think it’s real, and you might really try to pluck out your eye. The sane Andrea Yates would have never done this, but the insane one couldn’t process all of that stuff. How about culturally, like the Yates’ belief that Andrea should not only keep having children, but that she should stay home with them rather than returning to her career? One of the things that I discovered about Rusty Yates is that when I was with him one-on-one, the things he would say would make total sense. Then I would walk away from him and go, “What?” What I realized from that is Andrea was never able to get away and think for herself. She was isolated from her friends and her family, and if something didn’t make sense, she never had that opportunity to go away and think about it. It was sort of like the cult syndrome, where they isolate you from everyone so that all you hear is what they believe—and so you start believing it too. Growing up, Andrea Yates was quiet and shy—but she was also a striver. She was a person who went for things, whether it was swimming or being a perfect nurse. She was ambitious. And all of a sudden, that’s all taken away from her. Do you think Rusty Yates should have been held more accountable for his role in Andrea’s crime? I always tell people that there are generally Rusty lovers and Rusty haters. There’s not too much in between. And Rusty is not as perfect as the Rusty lovers think, but he’s not as horrible as the Rusty haters think. He is a guy who kind of has tunnel vision, and from what I understand, to work at NASA this is kind of the way you have to be. He sets his mind on a goal, and nothing’s going to get in the way of that, whether it’s a sick wife or whatever. Does that mean he’s a bad person? If you have a flat tire on the side of the road, he’s going to be there to help you. Just about every true crime book I write has some aspect of mental illness in it, and [what I’ve found] is that when you’re dealing with that, with a loved one, you don’t always know what to do. The bottom line, also, is that the man lost his wife and five kids, and I’m not going to jump on and slam him. Do I think he did everything right? No. Do I think he did everything wrong? The main thing was ignoring the doctor on saying “Don’t have any more kids.” I believe he says he took that more as a suggestion rather than a serious order. He thought of that as the same way with having another baby and postpartum depression. I don’t think he understood, or had it explained, or maybe he just denied, that usually each case of postpartum depression and psychosis is worse than the previous. Wow. So he just had no frame of reference. I think a lot of us didn’t. But now, because of the Andrea Yates case, we do. When the book first came out, I did interviews on radio call-in shows, and people would say, “This could never happen in my family. My wife would never do that.” Well, any female who has a baby can get postpartum depression, which can develop into postpartum psychosis. It’s mentioned in the book that Rusty Yates didn’t believe in mental illness. One time, I was doing a radio interview out of Las Vegas, and they had Ann Coulter on with me. She was adamant that mental illness does not exist. It stuns me because here is a prime example of a horrible, horrible tragedy that could have been prevented if someone had believed in mental illness and getting the right help and that there are options out there. One reason I fought so much for Breaking Point to be reissued was because of education—please, let’s learn, let’s keep our eyes open, and if we don’t know what to do, call a help line or call your doctor. Just get some help. And there is more awareness about postpartum depression—even celebrities will admit to having it. How much did the Andrea Yates case have to do with that? The defense attorneys say that’s one reason the second trial was successful in getting a not guilty by reason of insanity verdict: the public is better educated this time, and knew about it. You mentioned earlier that your true crime books often include themes of mental illness. Are you specifically drawn to these types of cases? Initially, it’s subconsciously what I was drawn to. When I was an undergraduate at Baylor, I really wanted to be a psychology major. But it was required that you did a rat lab, and I’m terrified of rodents. I couldn’t do it! [Laughs] So I’ve always been very interested in psychology and sociology, and you get to delve into that in true crime. My first book was Wasted. When I first met the killer [in that case], I thought he had a chance of being rehabilitated if he got the proper counseling. Then, after interviewing him again 10 years later, I saw how he had changed after a decade of solitary confinement. He seemed like a crazed person who had no help of rehabilitation, and I thought, “Oh my gosh, if this guy gets out, he’s definitely going to kill again.” His mental health state had changed that much. 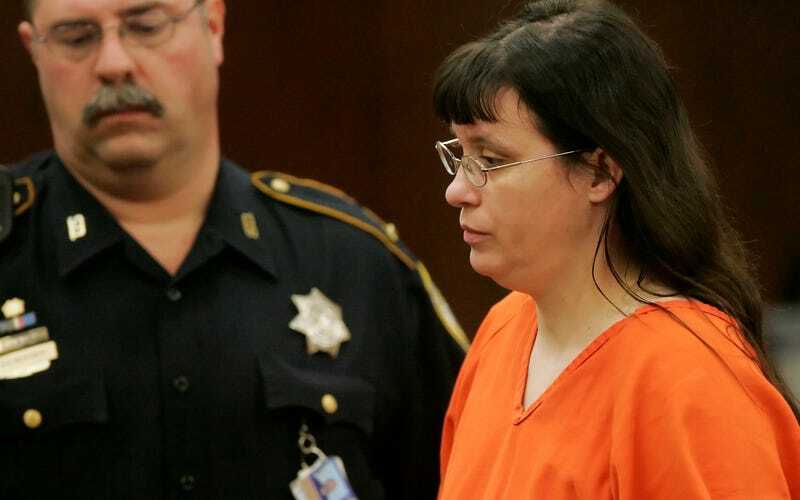 Do you think Andrea Yates will ever be released? Absolutely not. I don’t think the judge would go for it, and based on the public’s reaction to when she just requested to be able to go to church—at that point, her attorney, George Parnham, told me that they will never make another request like that again. Besides that, Andrea feels safe where she is, in Kerrville State Hospital. That has become her family; the nurses and the patients there are family, and that’s where she feels safe and secure. But even if she wanted out, I don’t think that would ever, ever happen. Not in Texas. Yates family photo (taken before Mary Yates was born) and Andrea Yates booking photo courtesy of Diversion Books.